The entire code sample (in C#) for this article is available through here. The solution I’ve created to demonstrate the concepts is a simple one that includes a project with the “business logic”(SampleApplication) which is in charge of retrieving words from a file and then concatenating them into a sentence. I’ve separated the tasks involved into different objects to demonstrate the composability and separation of concerns that will typically take place in a real project. On top of the BL I’ve included a web application project(SampleApplication.Web) that contains the WCF service which exposes the functionality through a web service. Of course, I’ve also added the test projects that test that everything is working as it should. 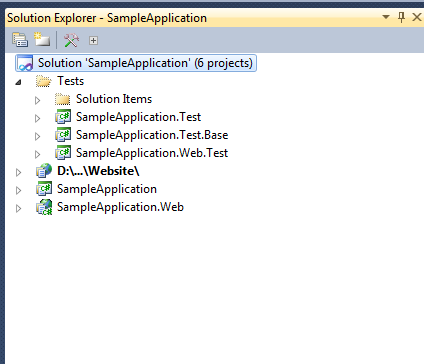 The testing library I’ve chosen to use is the one built into .NET and Visual Studio, not because it’s the best, its actually alright to use (definitely not great), but because it’s the only one that has a somewhat decent integration with Visual Studio. I’ve tried using NUnit but there is no good integration with the IDE, the ones I found were quite awful. Next, being able to test your code effectively relies a lot on the way you write your code and whether you follow concepts like Inversion of Control and Cohesiveness. The closer you follow the best practices the easier it becomes to test your code and really makes a difference in whether you can create specific unit tests that test a very limited scope of functionality as they should. Managing dependencies between objects is therefore very important and while you can do it yourself there are frameworks dedicated to achieving just this. I’ve been following MEF(Managed Extensibility Framework) for a few years now, well before it became part of the official .NET framework and I find it very simple yet powerful to use. Small note: The MEF version I’m using for the samples in this article is the one that shipped with .NET 4 and not any of the newer previews available on the codeplex site. While I was looking for examples on how to use MEF in a real application many of them show the composition taking place inside the application’s objects. Many examples show constructors that either define the CompositionContainer and/or accept it as a parameter. To me this looks wrong. I don’t want my plain objects to be aware of MEF any more than they should and I don’t want composition logic in my objects. I want these separate so there is less dependency on MEF and if needed, that I could replace MEF with another framework without having to gut half of my code. Because of this requirement I came up with the structure where for my test projects the composition is done by using a test base class all tests inherit from and for my web application the composition happens in the WCF pipeline (second part). I’ve divided my tests into two main types: those that test functionality without mocking and those that test functionality while mocking out the dependencies. The tests that don’t need any mocking can inherit from my AutoTestBase abstract class. This class calls the AutoWire function of the TestBase class in its constructor without any parameters. The AutoWrite function looks at the XML configuration and passes the assemblies to the CompositionContainer. So when my test methods are called any import should already be fulfilled and the tests can be carried out. Notice that there isn’t even a single line of wire up code in this class which is what my goal was. My mocking tool of choice is Moq. It’s a great library with excellent support for Linq and Lambda expressions. For tests that do require mocking, there is a bit more work to do but not much. This part of the solution took me probably the most time to figure out and I couldn’t have done it without the code sample I found here: http://pastie.org/467842. I adapted it a bit but basically what it allowed me to do was to create an ExportProvider which is filled with the mocked objects. This provider is passed into the container first so the mocks will be the ones used to satisfy the imports and not the real implementations. What it does is to collect the assemblies passed to it in an AggregateCatalog and pass it into the composition container. If a MockExportProvider is passed, it will be pushed into the container first so the mocks will be used to match any relevant import. Once the container is set I call ComposeParts on the test class so any of its dependencies and their own dependencies are fulfilled by MEF. Thats it for now. In the second part of this article I discuss how to set up a WCF service using MEF. and the imports within HelloWorldSentenceService are also being satisfied..But I want to create a object of HelloWorldSentenceService and want the imports to be satisfied. Hi, Im not sure if completely understand the question but let me try. If what you mean is that you would like to instantiate your own HelloWorldSentenceService then I’d say youre going in the wrong direction. The whole idea behind dependency injection is that your classes should not be aware of concrete implementations (ie HelloWorldSentenceService) but should only know about interfaces (ie ISampleSentenceService). The framework should provide the implementations in run-time so your classes remain decoupled as much as possible. If you just do “new HelloWorldSentenceService” you will not be able to unit test your code correctly either. As a service in this example, HelloWorldSentenceService is used as singleton so its not instantiated once. If your service contains internal data that should not be shared between requests or classes, you can tell MEF to instantiate a new instance every time, using the [Import(RequiredCreationPolicy = CreationPolicy.NonShared)] attribute definition. check out http://mef.codeplex.com/wikipage?title=Parts%20Lifetime for more documentation on this topic. Thanks for your reply. I was trying do “new HelloWorldSentenceService()” for unit testing purpose. And by doing so it seems the imports withing the HelloWorldSentenceService are not being satisfied. Is there any way to do so?